This one kg delicious pineapple cake will grace all the special occasions of your near and dear ones. The cake is round in shape, featuring some beautiful decorations that will catch everyone's attention. 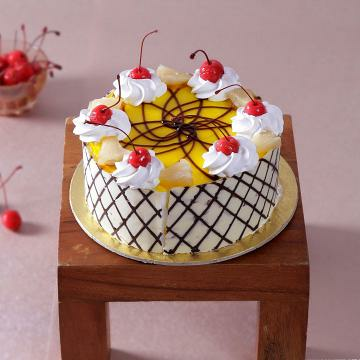 Buy 1 Kg Round Pineapple Cake w/ Cherry & Cream Toppings, sold & shipped by IGP India where you can shop online for Send Cakes, Flowers & Gifts to India - Anytime/Anywhere. This Chocolates & Cakes collection has been tagged as gift express delivery to india, birthday, anniversary, valentine day, mothers day, fathers day, send gift from usa.